I can remember growing up watching Bugs Bunny. It was actually one of my favorite cartoons. I'm glad to see him still in action with all of his pals (and some new ones) in new adventures like Rabbits Run. My kids actually sat down and watched the whole movie with me and laughed a ton. I was glad to see them enjoy Bugs just as much as I always had. What happens when Bugs Bunny becomes embroiled in a scheme surrounding the invention of a highly-sought after invisibility spray? 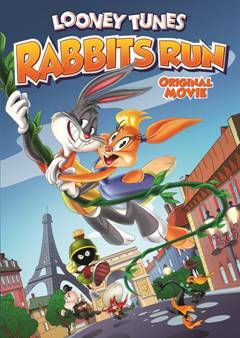 The result is a mad-cap adventure set in New York City and Paris titled Looney Tunes Rabbits Run. In Looney Tunes Rabbits Run, Bugs Bunny is a New York City cabbie who picks up the beautiful but bumbling perfume salesgirl, Lola Bunny, after she’s lost her job at a department store. Bugs, who drives Lola home from work in his taxi, has no idea he’s about to embark on the longest ride of his life! In her spare time, Lola is an amateur perfume maker who’s convinced one day she’ll concoct the world’s most beautiful fragrance and sell it to the House of Moufette in Paris. Unbeknownst to Bugs, Lola, in one of her attempts to create the next big fragrance, has inadvertently invented an invisibility spray, and now the whole world is on their tails to steal her precious concoction! On the run to Paris, Bugs and Lola must outsmart everyone from government officials, to Lola’s greedy department store boss, Giovanni and even Yosemite Sam, all of whom are after Lola’s “scent-sational” invisibility spray. Will Bugs help Lola thwart the bad guys and help her realize her dream of launching her own signature fragrance line? It’s a heart-stopping, looney adventure that animation fans won’t want to miss! Joining Bugs and Lola is a lineup of favorite Looney Tunes characters including Speedy Gonzalez, Elmer Fudd, Daffy Duck, Pepe Le Pew, Foghorn Leghorn and many others. I used to love Looney Tunes when I was a kid but I have not watched this cartoon in a very long time. I liked the Looney Tunes that came out with the "Baby" versions.